How to remove Axis scaling on unwanted regions? I am working with JMP 11.2.0 version . Kindly have a look at the attached graph. In the graph, I have plotted Data Vs Time with respect to the STEP. On the X-axis, we can find the axis range from 0-8 for STEP1 and STEP2 respectively. 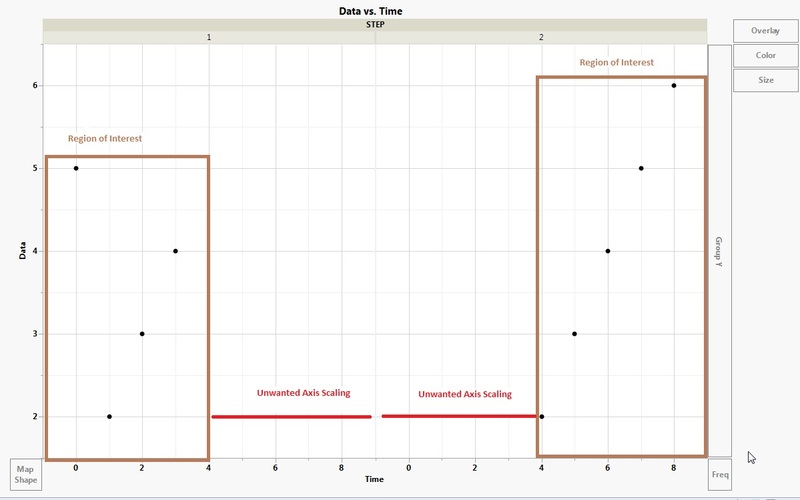 In the graph, the Brown indicates the region of Interest where data is present and Red indicates the unwanted scaling that happens automatically. For STEP1, data is present between 0 and 4(X-axis) and for STEP2, data is present between 4 and 8. The unwanted axis scaling regions for STEP1 is 4 - 8 and the unwanted axis scaling region for STEP2 is 0-4. Problem : How to remove these unwanted axis scaling regions. Re: How to remove Axis scaling on unwanted regions? does using the overlay rather than wrap for the step do what you want? Sorry, I did not mention about sample. We actually use another column Sample. We use Sample as the overlay element. The below shows the extended data set. So we don't want STEP to be as a Overlay element. maybe use color instead of wrap. Set the modeling type (or maybe use character values) for step and sample to ordinal to get a legend that isn't continuous. the 1s and 2s are confusing, make the columns character and name the steps and samples might help.